The conference will feature famous American economist, Jeffrey Sachs, who is the director of the Earth Institute at Columbia University. The U.N. Secretary General, Ban Ki-Moon, will be giving the opening address. The world’s leading climate scientists are expected to attend the conference on climate change, together with participants from major world religions, as they aim to elevate the debate on the moral dimensions of protecting the environment in advance of the papal encyclical. According to the Vatican, the summit will be highlighting the intrinsic connection between respect for the environment and respect for people. This focuses especially on the excluded, the poor, the children and future generations, and the human trafficking and modern slavery victims. The one-day conference is expected to help create a global movement across all religions for sustainable development and climate change for 2015 and beyond. After Pope Francis expressed disappointment with the Lima climate talks, he promised to increase pressure on world leaders. He hopes to influence the climate talks happening at the end of the year in Paris, through his encyclical. The encyclical is expected to be published in early summer and, church historians say, represents the first time in memory that such an important papal writing is being timed by a pope to influence a civil process — in this case, a major U.N. summit in December on climate change. Based on remarks and writings by the pope and his close advisers, most pope-watchers think Francis will raise urgent concerns about global warming and highlight human impact on climate change. More broadly, they expect Francis to frame with new emphasis the Earth’s health as a core Catholic social justice concern, up there with topics such as poverty and abortion. “This has the outreach potential that nothing else has had,” said Mary Evelyn Tucker, co-director of the Forum on Religion and Ecology at Yale University, one of the biggest in a cluster of new groups aimed at connecting faith communities with environmental concerns. Environmentalism and global warming are not new topics for the Catholic Church. Church leaders — including Pope Benedict — in the last couple decades have been slowly connecting the environmental, moral and economic costs of globalization. However, these connections have never been put forth fully in an encyclical, considered uniquely authoritative in Catholicism. How strongly will he make the case that humans are causing global warming – a case that many Republicans and many conservative Christians don’t buy, think is dangerous to the free market and don’t think a priest – even a pope – is qualified to make? And will he break new theological ground in how he frames care for the environment – describing it not only as a means of helping man (who Genesis says God meant to have “dominion” over other living things) but with value independent of humans? Also unknown is how, specifically, Francis will urge his church to respond. Will bishops be expected to prioritize the topic in their investments, political efforts, sermons? Indeed, Catholicism has a big stake in this encyclical. Such documents are considered among the most authoritative teachings of the church, but in recent decades Catholics regularly blow off their mandates on topics like contraception and divorce. Francis’s writing will push the question: How much influence can even this pope have on modern behavior — Catholic and otherwise? Christiana Peppard, a theologian who focuses on environmental ethics at Fordham University, predicted Francis may break ground in potentially two areas. These are the areas that have the potential for controversy – how strongly he links human behavior to climate change and whether he sets forth an idea of creation that doesn’t have humans alone at the center. Chad Pecknold, a theologian at Catholic University, predicted Francis will do neither, particularly the former. “The moment he would make a strong scientific claim about humans’ role, those Catholics who would dissent from that view would have a claim within the tradition to say the pope has overstepped his bounds,” which would squander a chance to broaden how believers think about the environment, Pecknold said. 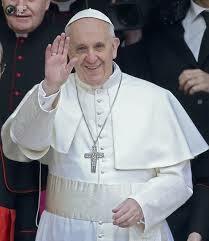 He believes Francis will characterize “the human role” in global warming in Biblical terms: That our disconnect with the environment began with Adam and Eve, and the “turning away from our dependence on the order of Creation.” That turning away would include divorce, gay marriage, “and most especially abortion and euthanasia as evidence of a ‘throwaway culture,’” Pecknold said, using a term Francis often says about everything from treatment of the elderly to addicts. However given Turkson’s and Francis’s previous comments about the human impact on climate change, it seems likely the pope will prescribe both policy and spiritual remedies. Robert Nelson, a University of Maryland economist who focuses on environmentalism and religion, predicted the encyclical “will go over well everywhere except with Republicans.” However, he said, a group that often talks about ethics being too absent from public life could find themselves tempted by a pope putting care for creation back into a traditional framework. Anthony Annett is a climate change advisor and Catholic writer brought on to the prominent Earth Institute at Columbia University to help bridge the gap between environmentalists and religious communities. Considering Francis chose to name his papacy after the patron saint of animals and the environment and is the most retweeted person on the planet, expectations among environmentalists are soaring. I wonder if mindless “breeding like rabbits” has any effect on the environment? I wonder if the mentality of “We should just have as many children as G@dwill give” will be discussed by the celibate bishops.